The past year of my life has looked nothing like I had in mind, in the best way possible! Last Summer I was finishing up my dual credit college courses, in hope to find some direction for my next semester. Yet, what I heard I didn’t believe was the Lord. “You need to rest.” The closest people in my life were telling me the same thing, yet, I couldn’t get past my mental drive or definition of “success”. My whole life I thought that if I’m in school, pulling my grades well, and doing the regular “Christian duties” I would be deemed as a success. The Lord wanted to change that definition! As I tried to ignore that still small voice, scared of where it would take me, I got frustrated and worried and felt the weight of my future encompass me. It wasn’t a light burden, it became heavy real quick. Little did I know I was literally taking my future plans, wants, and desires right back out of the hands of the One who holds it all. Now THAT’S scary! LOL! Did I mention I hadn’t even graduated high school yet? The burden became heavy for too long, so I gave it back to the only one I knew who could help me. As I’m “praying” (whining really and crying to God about what I did to myself) I felt his warm love and peace come over me and I was put at rest. He then again whispered, “You need to rest.” So I took a semester off of college to graduate high school (yes you read that right), and entered into one of the most refreshing, yet tough seasons. All of my friends were going to school, and all I could think about is how far behind I was going to be COMPARED to everyone else. And just like that, lesson number 1! Comparison. I had a close friend that was on the same track as me, did the same high school path, and the same junior college during high school. We became so close, I basically LIVED at her house between all the studying, talking and silly girl time. I saw all areas of her life just as she saw mine! Yet, I had some obvious issues and she seemed to have none. In my mind all I saw was a perfect daughter, with all A’s in college, always in church, reading her bible, and was ALWAYS so sweet. My heart hated myself because I couldn’t live up to her. I couldn’t do as well as her in school, and I DEFINETELY couldn’t be that sweet all the time. I was confused and hurt. How could someone literally be perfect? I thought perfection was an illusion? And it still is. I was living in a place of not enough, full of fear and insecurity. I had a thought process geared to please and make everyone happy with me. And in reality, I was never taking care of my own inner being. The Lord began to unfold how unique I am to him. I started painting to get the flow of what was inside, out. He began to speak to me multiple times about how my life path didn’t look like anyone else’s. So as I’m staying home, “resting” for hours with the Lord, she is working toward her career. Which is a beautiful, appropriate thing for her life at this time. I had to come to terms that I am only me, and what I do isn’t the same as others. Her path, isn’t mine. What I thought was so beautiful was… that in the moments I was jealous towards her… when I felt like she “got everything” and had “everything together”… the Lord didn’t break her down in my mind. All He did was remind me how much He loved her, how beautiful she was to Him. Then He would remind me how unique and beautiful I was to Him. “Grace, I’m pleased with you right here.” He reminded me of when heaven opened after Jesus’s baptism. Jesus hadn’t performed one miracle for God, yet, He embraced him as His son in whom He is well pleased. 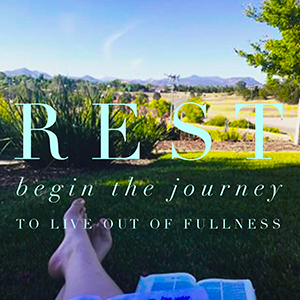 This is when the journey to live out of fullness began. I apologized to my friend, not for her, but for me. And I placed another part of my heart in to the Lord’s hands.